In The Triumph of Christianity, Bart D. Ehrman attempts to answer the crucial question of how Christianity succeeded when other comparably small religious sects lost traction or disappeared completely. Few writers in the religious field have the combination of skills Ehrman demonstrates: he is a Biblical scholar (Distinguished Professor of Religious Studies at the University of North Carolina at Chapel Hill) with a long and celebrated list of well-researched and thoughtful essays and books about religion. In addition to his academic expertise, his writing style and ability to cogently explain even the most arcane point make his scholarship easily accessible to the general public. With more than thirty years of study and twenty-five previous books, Ehrman has brought his work into sharp focus in this enlightening and serious work of scholarship. Ehrman’s study spans the first 450 years of the Christian Era (CE), beginning with the reign of Caesar Augustus (29 BC to 14 CE) and ending in 422 CE when Augustine wrote The City of God. Significant events within this timeframe include the birth and death of Jesus (4 – 30 CE), Pliny’s persecution of Christians (112 CE), the conversion of Emperor Constantine (312 CE), Eusebius’s Church History (324 CE), and the anti-pagan legislation of Theodosius I (381 – 392 CE). Ehrman suffered a crisis of faith as a young college student while studying 19th Century literature, Matthew Arnold’s “Dover Beach” in particular. This led to a life-long effort to reconcile his faith with “the geological and biological sciences … which posed problems for my faith, much as they had for the intellectuals in Arnold’s era.” The success of Christianity “proved to be the single greatest cultural transformation our world has ever seen.” It led to what we now count as Western Civilization, a term that encompasses, for example, the Renaissance, Shakespeare, Michelangelo, and Bach. Ehrman has “tried to explain the triumph of Christianity without making it a triumphalist narrative.” The Christianization of Rome (which set the stage for the religion’s wider acceptance across Europe) was never inevitable. Ever the historian, he acknowledges that circumstances fell into place to further the cause. An emperor dies early; another wins a crucial battle; Paul “sees the light.” It is a compelling argument through historical facts and sound inferences that explain how Christianity became the dominant religion of the West. The Triumph of Christianity is an important addition to religious studies, valuable to academics and the general public, whether believers or non-believers. There is much here to savor, to think about, and, perhaps, to argue about. 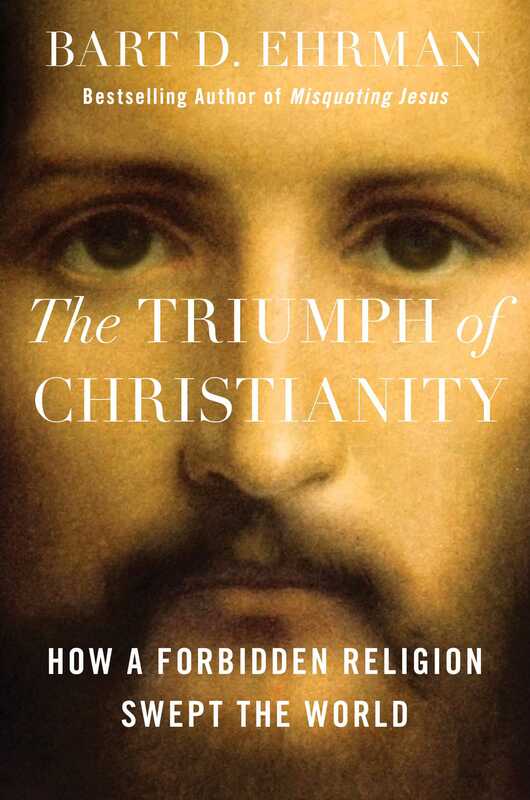 Ehrman combines scrupulous research with a felicitous style to present a compelling and highly readable argument on how Christianity has prevailed.